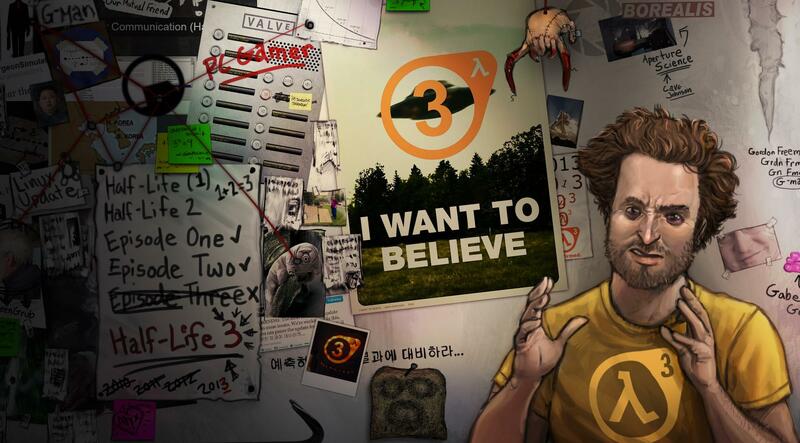 Half-Life 2: Episode 3's Story as Released By Marc Laidlaw on his official blog. I hope this letter finds you well. I can hear your complaint already, "Gordon Freeman, we have not heard from you in ages!" Well, if you care to hear excuses, I have plenty, the greatest of them being I've been in other dimensions and whatnot, unable to reach you by the usual means. This was the case until eighteen months ago, when I experienced a critical change in my circumstances, and was redeposited on these shores. In the time since, I have been able to think occasionally about how best to describe the intervening years, my years of silence. I do first apologize for the wait, and that done, hasten to finally explain (albeit briefly, quickly, and in very little detail) events following those described in my previous letter (referred to herewith as Episode 2). To begin with, as you may recall from the closing paragraphs of my previous missive, the death of Eli Vance shook us all. The Research & Rebellion team was traumatized, unable to be sure how much of our plan might be compromised, and whether it made any sense to go on at all as we had intended. And yet, once Eli had been buried, we found the strength and courage to regroup. It was the strong belief of his brave daughter, the feisty Alyx Vance, that we should continue on as her father had wished. We had the Arctic coordinates, transmitted by Eli's long-time assistant, Dr. Judith Mossman, which we believed to mark the location of the lost research vessel Borealis. Eli had felt strongly that the Borealis should be destroyed rather than allow it to fall into the hands of the Combine. Others on our team disagreed, believing that the Borealis might hold the secret to the revolution's success. Either way, the arguments were moot until we found the vessel. Therefore, immediately after the service for Dr. Vance, Alyx and I boarded a helicopter and set off for the Arctic; a much larger support team, mainly militia, was to follow by separate transport. At this point we were briefly detained–not captured by the Combine, as we feared at first, but by minions of our former nemesis, the conniving and duplicitous Wallace Breen. Dr. Breen was not as we had last seen him–which is to say, he was not dead. At some point, the Combine had saved out an earlier version of his consciousness, and upon his physical demise, they had imprinted the back-up personality into a biological blank resembling an enormous slug. The BreenGrub, despite occupying a position of relative power in the Combine hierarchy, seemed nervous and frightened of me in particular. Wallace did not know how his previous incarnation, the original Dr. Breen, had died. He knew only that I was responsible. Therefore the slug treated us with great caution. Still, he soon confessed (never able to keep quiet for long) that he was himself a prisoner of the Combine. He took no pleasure from his current grotesque existence, and pleaded with us to end his life. Alyx believed that a quick death was more than Wallace Breen deserved, but for my part, I felt a modicum of pity and compassion. Out of Alyx's sight, I might have done something to hasten the slug's demise before we proceeded. Not far from where we had been detained by Dr. Breen, we found Judith Mossman being held in a Combine interrogation cell. Things were tense between Judith and Alyx, as might be imagined. Alyx blamed Judith for her father's death…news of which, Judith was devastated to hear for the first time. Judith tried to convince Alyx that she had been a double agent serving the resistance all along, doing only what Eli had asked of her, even though she knew it meant she risked being seen by her peers–by all of us–as a traitor. I was convinced; Alyx less so. But from a pragmatic point of view, we depended on Dr. Mossman; for along with the Borealis coordinates, she possessed resonance keys which would be necessary to bring the vessel fully into our plane of existence. What happened next is even harder to explain. Alyx Vance, Dr. Mossman and myself sought control of the ship–its power source, its control room, its navigation center. The ships's history proved nonlinear. Years before, during the Combine invasion, various members of an earlier science team, working in the hull of a dry-docked vessel situated at the Aperture Science Research Facility in Michigan, had assembled what they called the Bootstrap Device. If it worked as intended, it would emit a field large enough to surround the ship. This field would then itself travel instantaneously to any chosen destination without having to cover the intervening space. There was no need for entry or exit portals, or any other devices; it was entirely self-contained. Unfortunately, the device had never been tested. As the Combine pushed Earth into the Seven Hour War, the aliens seized control of our most important research facilities. The staff of the Borealis, with no other wish than to keep the ship out of Combine hands, acted in desperation. The switched on the field and flung the Borealis toward the most distant destination they could target: Arctica. What they did not realize was that the Bootstrap Device travelled in time as well as space. Nor was it limited to one time or one location. The Borealis, and the moment of its activation, were stretched across space and time, between the nearly forgotten Lake Huron of the Seven Hour War and the present day Arctic; it was pulled taut as an elastic band, vibrating, except where at certain points along its length one could find still points, like the harmonic spots along a vibrating guitar string. One of these harmonics was where we boarded, but the string ran forward and back, in both time and space, and we were soon pulled in every direction ourselves. Time grew confused. Looking from the bridge, we could see the drydocks of Aperture Science at the moment of teleportation, just as the Combine forces closed in from land, sea and air. At the same time, we could see the Arctic wastelands, where our friends were fighting to make their way to the protean Borealis; and in addition, glimpses of other worlds, somewhere in the future perhaps, or even in the past. Alyx grew convinced we were seeing one of the Combine's central staging areas for invading other worlds–such as our own. We meanwhile fought a running battle throughout the ship, pursued by Combine forces. We struggled to understand our stiuation, and to agree on our course of action. Could we alter the course of the Borealis? Should we run it aground in the Arctic, giving our peers the chance to study it? Should we destroy it with all hands aboard, our own included? It was impossible to hold a coherent thought, given the baffling and paradoxical timeloops, which passed through the ship like bubbles. I felt I was going mad, that we all were, confronting myriad versions of ourselves, in that ship that was half ghost-ship, half nightmare funhouse. What it came down to, at last, was a choice. Judith Mossman argued, reasonably, that we should save the Borealis and deliver it to the resistance, that our intelligent peers might study and harness its power. But Alyx reminded me had sworn she would honor she father's demand that we destroy the ship. She hatched a plan to set the Borealis to self-destruct, while riding it into the heart of the Combine's invasion nexus. Judith and Alyx argued. Judith overpowered Alyx and brought the Borealis area, preparing to shut off the Bootstrap Device and settle the ship on the ice. Then I heard a shot, and Judith fell. Alyx had decided for all of us, or her weapon had. With Dr. Mossman dead, we were committed to the suicide plunge. Grimly, Alyx and I armed the Borealis, creating a time-travelling missile, and steered it for the heart of the Combine's command center. At this point, as you will no doubt be unsurprised to hear, a Certain Sinister Figure appeared, in the form of that sneering trickster, G-Man. For once he appeared not to me, but to Alyx Vance. Alyx had not seen the cryptical schoolmarm since childhood, but she recognized hi, instantly. "Come along with me now, we've places to be and things to do," said G-Man, and Alyx acquiesced. She followed the strange grey man out of the Borealis, out of our reality. For me, there was no convenient door held open; only a snicker and a sideways glance. I was left alone, riding the weaponized research vessel into the heart of a Combine world. An immense light blazed. I caught a cosmic view of a brilliantly glittering Dyson sphere. The vastness of the Combine's power, the futility of our struggle, blossomed briefly in my awareness. I saw everything. Mainly I saw how the Borealis, our most powerful weapon, would register as less than a fizzling matchhead as it blew itself apart. And what remained of me would be even less than that. Yours in infinite finality, Gordon Freeman, Ph.D.